High in Nutrients: Fish is high in many nutrients that most people aren’t getting enough of, this includes high-quality protein, iodine and various vitamins and minerals. Besides this fatty fish (like salmon, trout, sardines, tuna and mackerel) are higher in fat-based nutrients. Prevents Heart Disease: Heart attacks and strokes are the two most common causes of premature death in the world and fish is generally considered to be among the best foods you can eat for a healthy heart. Researches have also revealed that the fatty types of fish are even more beneficial for heart health, because of their high amount of omega-3 fatty acids. Improves Skin and Hair: One of the biggest disadvantages of a low-fat diet is you often deprive your skin and hair of the healthy fat it needs, leaving it dull and dry. The omega-3s in fish are exactly the type of healthy fat to eat to keep your skin looking nourished and your hair shiny. Eases Depression: It may sound too good to be true but several studies have found that when taken along with prescription antidepressant medications, the omega-3s in fish are more effective at treating depression. Boost Brain Development: The omega-3 found in salmon and other nutrient-rich fish are essential nutrients for children because they contribute to brain development. Protect the brain from age-related deterioration: One of the consequences of aging is that brain functioning often deteriorates. Interestingly, many observational studies have shown that people who eat more fish have the capacity to protect their brain from deteriorating. People who eat fish regularly also have more grey matter in the brain centers that control memory and emotion. Rare source of Vitamin D: Fish and fish products are the best dietary sources of vitamin D, by far. Fatty fish like salmon and herring contain the highest amounts. Some fish oils, such as cod liver oil, are also very high in vitamin D. If you don’t get much sun and don’t eat fatty fish regularly, then you may want to consider eating fish as a vitamin D supplement. Hope you find enough encouragement to eat fish by all of the above points and if you consume fish often enough, you are sure to cure a lot of issues that your body may have to cope up with in future. 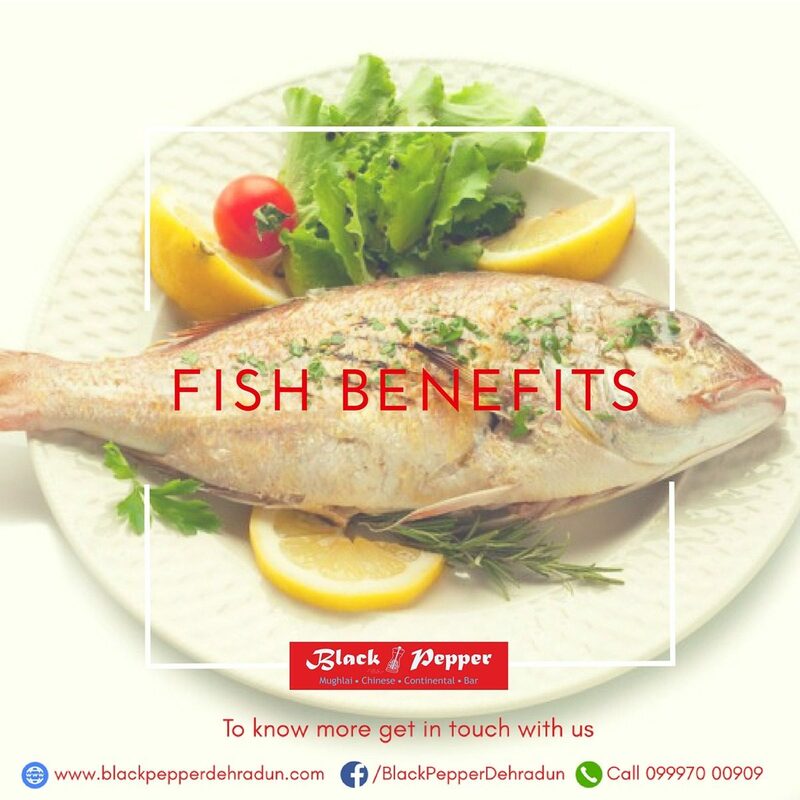 Black Pepper, which is among the finest Restaurants in Dehradun, continuously strives to serve you the best food alongside plentiful healthy fish options. It is arguably the best Indian Cuisine Restaurant in Dehradun and also a great choice for those looking for wedding caterers in Dehradun. You may want to visit us at http://blackpepperdehradun.com/ to explore more.